We had to surmount hitting a few snags, figuratively, but the project was a definite success. So, yes, we are "3." We are proud to have resurrected sailing cargo in the Mediterranean after a global hiatus of several decades. 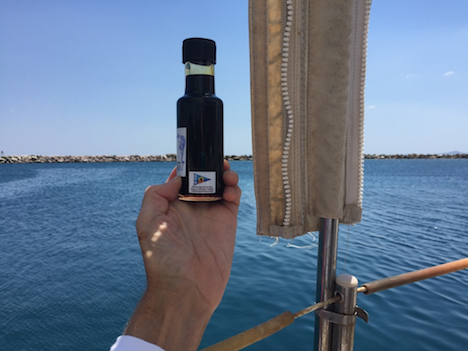 Our SAIL MED organization has been working on this and related projects since 2013. We're part of a global trend of moving cargo with clean, truly renewable energy. And it's fun helping to advance timeless Greek culture, which I know sounds grandiose. We are now engaged in follow-up for the shops now featuring sail transported products that we supplied. 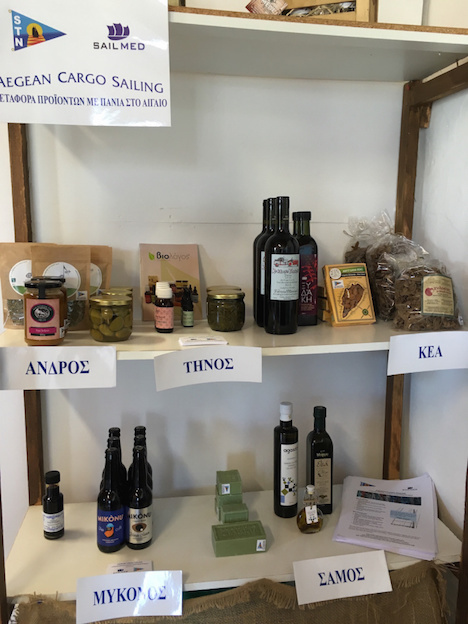 After the excitement of last month's maiden voyage, now we are handling the accounting-paperwork and securing the ongoing supply of such traditional items as olive oil soap, wild almonds, Mykonos beer, carob syrup, oregano, acorn flour, honey, and wine. And with the word spreading for our intentions to support the world's inevitable transition from fossil-fueld transport to sail power, we are hearing from more folk wishing to move product by the wind. The Pelago does have a small diesel engine, but it was only used for entering and exiting our island ports. By law, many harbors don't allow mooring or docking by sail power alone. So, these days a tugboat is employed, and sail transporters often look to electric motors that can run on solar panels, wind turbines, and a large, heavy bank of batteries. Think oars, too, for the future -- the proven auxiliary power for ancient Aegean craft. As a matter of fact, the first sustained sail transport project in modern times, in the Puget Sound off Seattle, was a 26-foot sloop, the Whisper, that used only a sculling oar for auxiliary power, in 2008-2009. The Sail Transport Company proudly flew the STN burgee. The two pictures following are that of the burgee and its evolution into the sail-transported logo for labelling products moved by the wind. What was supposed to happen after World War II, besides radioactivity, the Cold War, whole-hog cheap oil, and "prosperity" -- the Middle Class dream? The Jetsons with flying cars? As Pink Floyd wondered in The Final Cut, "What happened to the Post-War Dream?" The way it has played out -- burgeoning population, ecological devastation, resource limits fought over, Big Brother police state -- we cannot claim that the counterculture revolution or "progress" have taken the world in a safe direction. But some innovations and improvements in living in a sustainable fashion have taken hold and are growing. For me, a sail-transport project that intersects with the land and retailing is a dream come true, when it involves appropriate tech at every juncture. It took a while, what with more wars, to finally come up with a viable Post-War Dream -- part of a comprehensive vision of sustainability kept out of the corporate mainstream media. Almost every imagined detail from inception worked out. The pièce de résistance was the last cargo load from the islands sailed to Alimos, a large marina near Athens. Here's where we avoided trucking our cargo. From the dock the crew wheeled two large suitcases to the nearby electric rail tram. They rode to the terminus, the famous Syntagma Square. Then a two-block human-powered stint got our glorious sail-transported products to a chic health food store. The goods went up on display, captured by video. Interviews ensued for our mini-documentary. A fitting finale for our historic exploit! I ask, in the fog of idealism and envisioning a liveable future, who in their right mind would not want to see more of this kind of retro-revolutionary form of distribution of foods and beverages? Or, we just keep supporting with our purchases the diry-oil shipping and trucking of essentials. Given our attitude, you guessed it; donkeys and pedal power are on tap for next time, to complement sailing by the wind and using mass transit and walking, to bring organic food and drink to the market with a near zero carbon footprint. We are producing a professional video on Aegean Cargo Sailing's maiden voyage. In it we do a sample-carry with donkeys and explain their proper use. Sail transport is about being kind not just to sea animals, but animals on land too. The donkey will return in large numbers someday, I predict, and we can already appreciate their non-fossil fuel, sustainable capability. Perhaps the biggest development of the voyage was the creation of a network of island producers and a data base of their products. When we started the project, the prime goal was to get general exposure for sailing cargo. This could take many forms, and we have pursuied them. 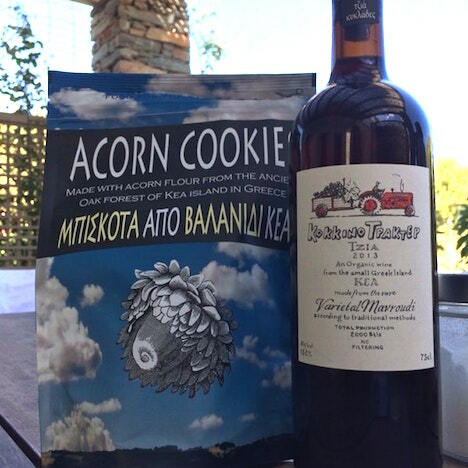 But our products coordinator Valia Stefanoudaki was all over it, finding retail outlets offering local foods, spices, and beverages: what did they carry, and what more would they like to carry? The extreme enthusiasm among the stores and producers made for healthy demand and cooperation. 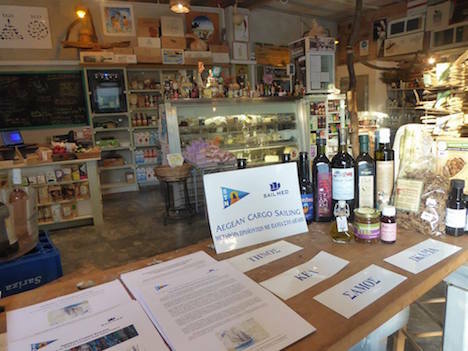 This is a promising beginning for Aegean Cargo Sailing. Also, we have a permanent place for our wares in a heretofore unlinked set of island stores, shops, and craft-factories. These small businesses, most of which rely on seasonal trade and tourism, now see through sail transport a niche market to expand their businesses and nurture their island crafts and crops. Not only have we done this with and for sail power; we have linked the producers and outlets together with maritime transportation that was lacking: ferries have dominated the Greek islands in recent decades, dismantling local systems of agriculture, while not serving every island community. So, sailing to small ports and exchanging goods is a step up for the islands in an age of big ferries running on petroleum. The ferries have trouble offering complete, reliable, low-cost service for all potential travellers and shippers. Fortunately, people have strong feelings about the sea, romantic islands, and worthwhile tourism. Black smoke from an oil-fired ferry does not make for happy tourists, at least visually. What sail transport lacks in numbers of ships today along with capacity for huge cargo loads, our "alternative" has a definite, growing future. Not everyone cares about the impact of conventional ships on sea life and on air quality, but the awareness of the global environmental crisis and the drive to change propulsion to renewable energy are feeding our movement. By the time the six-island voyage was half over, measured by our getting to almost a stone's throw from the Turkish coast, we had been providing desired products from islands further west, for retail displays, and in turn picking up what more an island had to offer. In the case of Samos, where our ship turned around to go serve the other five islands with customized boxes of high-quality, hand-crafted goods with the "STN sail transported" label on each item, we picked up olive oil soap, olive oil (extra virgin and flavored) and we left behind products for the outlets that otherwise would not be offered to the public. It was not a tough sell to get the island producers to see the advantages of sail transport of their products -- much as people have come to appreciate organic and fair-trade goods. 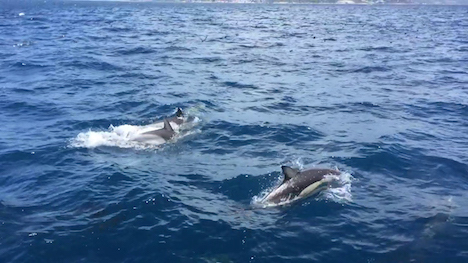 As our sloop approached Pythagoras Town on Samos, we were visited by an exuberant pod of dolphins who jumped for my camera. Turns out that this particular species is endangered! Our making no motor noise probably pleased our fellow mammals. SAIL MED has shown what is possible on a small budget with a group of friends and colleagues believing in a mission for our times. 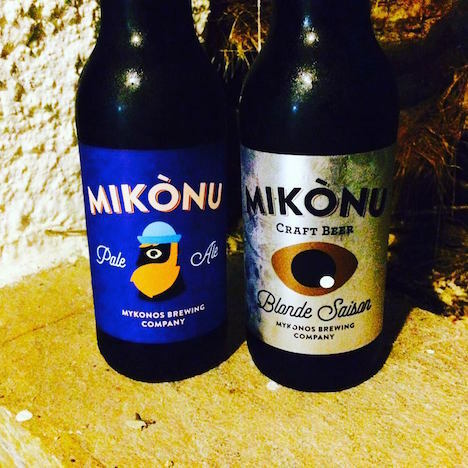 The Aegean has dozens more islands for us to add to our network for trading local products. A key feature of what we hope will be next year's and subsequent voyages is a larger vessel. So we are finding out about good deals on distress-sale vessels that at least have a good hull. One advantage of a boat in need of renovating is that we do not require fancy below-decks cabins and furnishings; it's more room for cargo with minimal redesign. Additionally, in case our sailboat purchase has to wait, or we have much work to do to ready a vessel for service, we can charter sailboats. This is in the long run expensive, but in our early development we are happy to meet demand and drum up interest in our concept. And, in solidarity and for the sake of exciting photo journalism, the Sail Transport Network and SAIL MED will continue to foster sail transport by any and all parties. In turn, we can use any exposure to spread the word on the fledgling Aegean Cargo Sailing project; after all, it has implications beyond the Aegean and the Mediterranean -- it may be up to you! It turns out that the more time you waste, the more time you have. Let me explain: The faster we try to bring things to market under the corporate, petroleum-powered system, we may be forcing ourselves to go faster without thinking or planning ahead. Just-in-time delivery is a needless luxury, but has become almost the standard for consumers often oblivious to the effort and distance involved in transporting. So if a sailboat is working on a different timeline and yet is still meeting requirements of the nascent niche market, there is no loss or harm except as measured by corporate bottom lines. If a sailboat is becalmed, delaying delivery, this experience offers a chance to swim in the sea, do maintenance on the boat, and ponder what we do onboard in comparison to desk jobs dealing with strangers online or by telephone. The more we can protect the environment with our transport method, and not contribute to global warming or oil spills, we are investing in more time for the human race in future. Hence, the more time we "waste," the more time we have. Take your time at 7 knots with the wind behind. Cure for Depending on 90K Oil Spewing Cargo Ships: Sail Power Makes Inroads, Now in Mediterranean by Jan Lundberg, June 15, 2017 (also appeared on Resilience.org as "Sail Power Makes New Inroads in the Mediterranean" June 16, 2017). Sail Transport Company of the Puget Sound - Capt. David Reid's update appearing on Sail Transport Network's website, 2009. Captain welcomes fresh crew for Mykonos leg. Note STN burgee and signage. Picturesque islands, turquoise water, sun and warmth and flowing champagne. 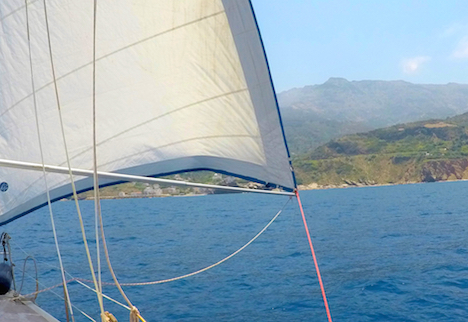 An unforgettable adventure sailing the Aegean with the Captain and the Miss. Thanks for sharing your beautiful home on the sea, we loved Greece and sharing it with special friends. We have many memories to reminisce for years to come. Continue to enjoy exploring and safe travel. how beautiful are the Greek Islands, sound like you are having a great time.Photos are beautiful,wish I was there instead of our cold winter.Keep enjoying it.When I was there in Mykonos there used to be a big Pelican that used to wander around, It has since died, but that was really quaint as well.Look forward to more. 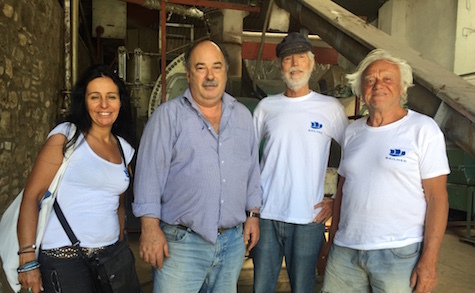 Thank you for sharing your article about We Did It: Sailing Cargo in the Aegean.